It’s the season for ramps here in Virginia and I’m a huge fan of the delicate onion/garlic flavor they develop when sautéed. Today I’ve added them to a mixture of caramelized mushrooms and crumbled bacon to make a fantastic and seasonal frittata. Start by cleaning and trimming the ramps (full directions with how-to photos here). Heat some oil in a cast iron skillet. Add the ramps and cook them for a few minutes on each side until they’re nicely caramelized. Mmmm. Remove the ramps from the skillet and chop them into 1/4-inch thick slices; set aside until needed. Using the same skillet, lower the heat to medium and saute the garlic in the butter for about 30 seconds. Add the chopped mushrooms and a pinch of salt. Sauté them, stirring occasionally, until the pan is dry and the mushrooms have begun to caramelize. Don’t be alarmed when the mushroom release their liquid… just keep cooking and stirring. After 5-10 minutes, all the liquid will have evaporated and the mushrooms will have begun to caramelize. 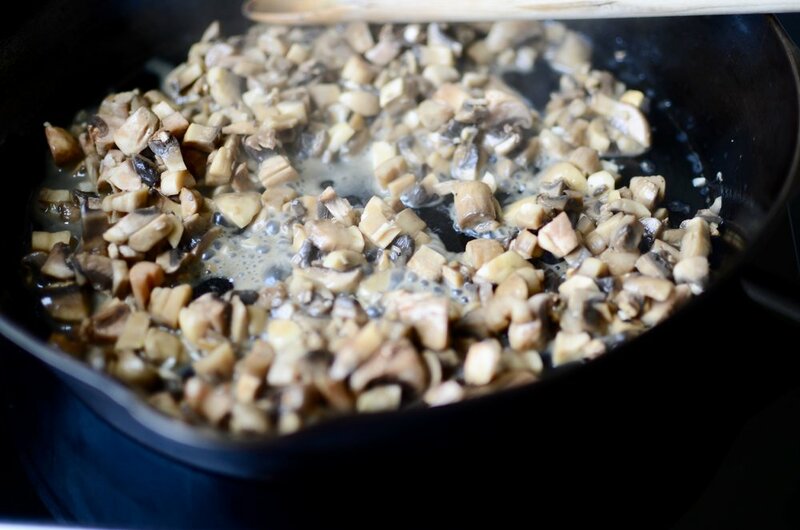 Remove the mushrooms from the pan and allow them to cool a bit before proceeding. Preheat the oven to 350F and place the rack in the center position. Spray a 9-inch pie plate with a nonstick baking spray like Baker’s Joy, which contains both oil and flour. My preferred pie plates for frittatas are ceramic, glass, or stoneware. Avoid using aluminum pie plates as there may be a chemical reaction that causes the eggs to taste tinny and/or turn a greenish color. In a medium mixing bowl, whisk the eggs together. Add salt, pepper, and heavy cream; whisk well to combine. Layer the mushrooms and ramps in the pie plate. Followed by the bacon. Add the beaten egg mixture. Be sure not to overfill the pie plate. Add cheese - here I’ve used cheddar. And to add a little color, I decided to add a few slices of sliced tomatoes to the top. Place the pie plate on a half sheet pan and place in oven. Bake for 30-35 minutes or until the eggs are set in the center of the pie plate. Allow to cool for 15 minutes before cutting. Preheat a large cast iron skillet with 1 tablespoon olive oil over medium-high heat. Remove ramps from pan and cut into 1/4-inch slices; set aside until needed. In the same skillet (without washing it), lower heat to medium and add butter and minced garlic; stir constantly for 30 seconds. 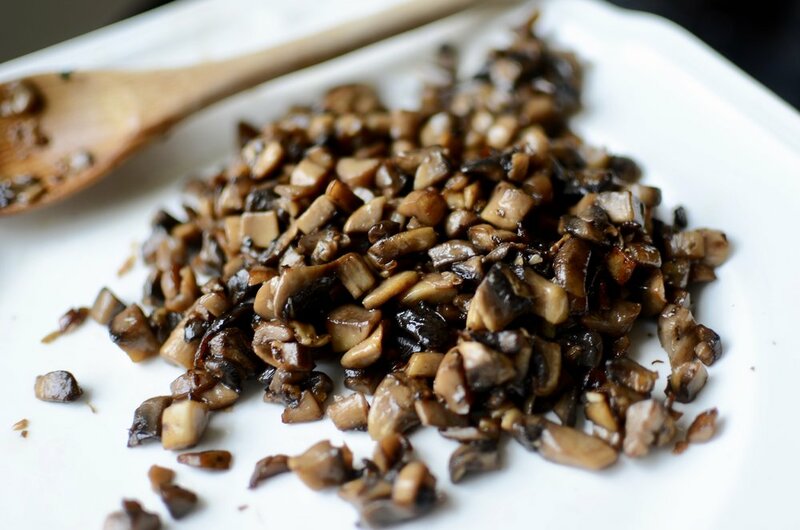 Add diced mushrooms with another pinch of salt and saute, stirring frequently for 5-10 minutes until the mushrooms are dry and beginning to caramelize; remove from pan and set aside to cool. Preheat oven to 350F with rack in center position and spray a 9-inch glass, ceramic, or stoneware pie plate with baker’s joy baking spray. 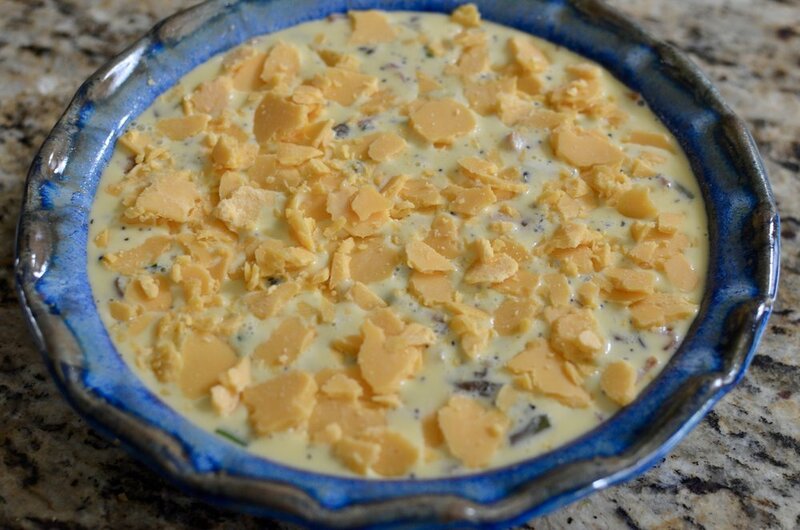 In a medium mixing bowl, whisk together the eggs, heavy cream, kosher salt, and freshly ground black pepper. 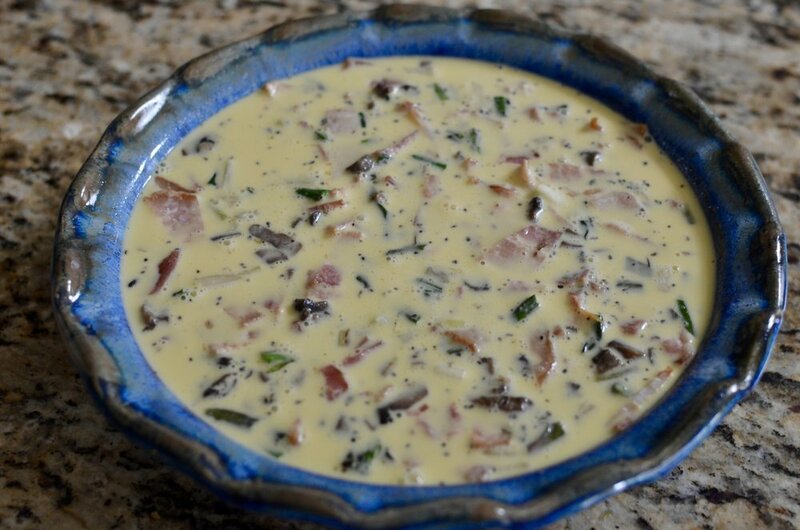 Layer the mushrooms, ramps, and bacon in the pie plate and add the egg mixture. 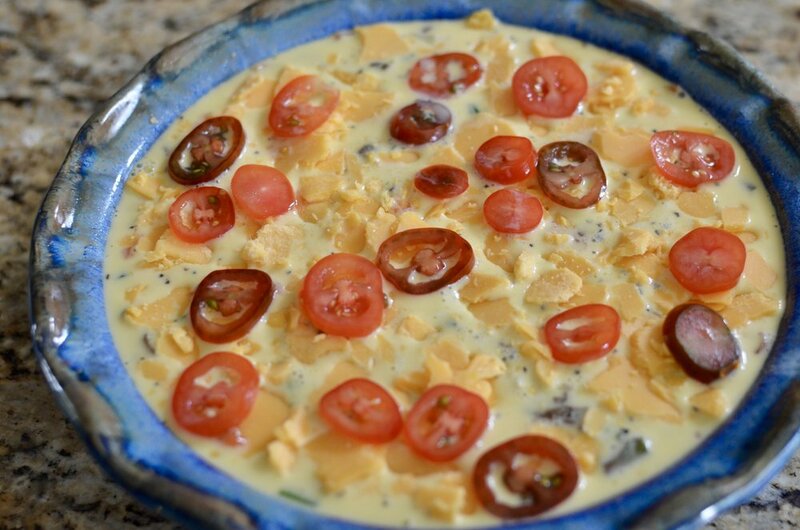 Add the cheddar cheese and sliced tomatoes. Place the pie plate on a half sheet pan and bake for 30-35 minutes or until the eggs are set in the center of the dish; cool 15 minutes before cutting.